Are you in control of your personal finances or does it seem like the other way around? For many of us, personal finances are a source of stress. Maybe you have some debt like student loans or credit card bills. Or maybe you’re concerned about your financial future. Whatever the case may be, personal finances have the ability to consume many of our waking thoughts. But that doesn’t always have to be the case, especially when we have them under control. 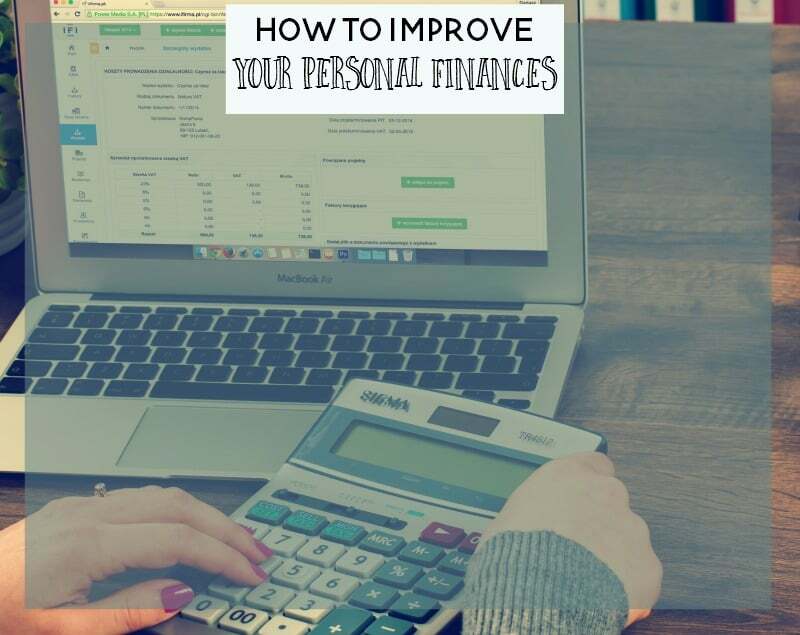 And if you’re looking for a few ways to improve your personal finances; this post is for you. If you want to save money, then look hard at your current spending patterns. It is easy to theoretically “wish” you could save money, but actually doing it requires some self-discipline and a little detective work. For one month, write down all of your expenses in a notebook. Commit to writing down everything, such as, morning coffee, taxi fare or pizza delivery for the kids. The more accurate and specific you are, then the better understanding you will get for where your money is really going. Scrutinize your log at the end of the month to find the areas you can cut back on and bank the savings. Small changes add up to big dollars over time, but you have to make the effort. After you’ve developed a clear cut budget, then develop a savings plan. Say you spend 75% of your income on bills, leaving 25%. With that 25%, determine what percentage you will save and what percentage will be your fun money. In this way, over time, you will develop a savings. Avoid thinking that you cannot afford to save up for an emergency fund because you barely have enough to meet daily expenses. The truth is that you cannot afford not to have one. An emergency fund can save you if you ever lose your current source of income. Even saving a little every month for emergencies can add up to a helpful amount when you need it. Always pay your credit card bill in full! Many consumers do not realize that paying only the monthly charges allows the credit card company to add interest to your payments. You may end up paying much more than you were originally quoted. To avoid these interest charges, pay as much as you can up front, preferably, the whole amount due. Another thing that you will need to be very concerned with when analyzing your personal finances is your credit card statement. It is very important to pay down your credit card debt, as this will only rise with the interest that is tacked onto it each month. Pay off your credit card immediately to increase your net worth. In order to maximize your personal finances, consider hiring a financial professional who can advise you about areas like investments and taxes if you can afford to do so. This will mean big savings in the long run, as someone who manages money matters for a living will not only be able to alert you to areas where you’re spending money unnecessarily, they’ll also have a much broader insight into investments as well. If your finances aren’t in good shape, you may feel lost. However, with just a bit of effort and will, you can get yourself back on stable footing. Your personal finances don’t have to run your life, take control of them now and make improvements where you can. Everything will work itself out in the long run.